The seventh annual Tucson Festival of Books is just around the corner, and yes, that’s a big deal. 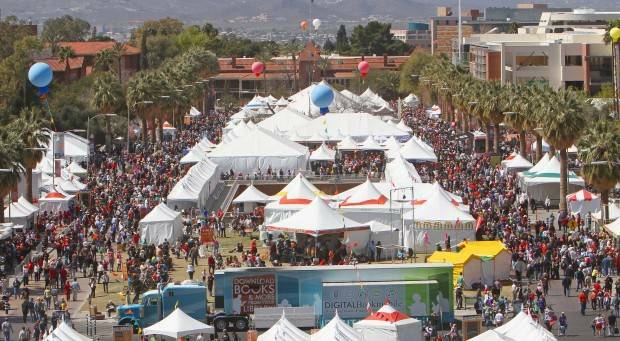 Although a relatively small city, Tucson boasts the third-largest book fair in the United States, with over 100,000 attendees annually. The festival features over 400 authors hosting a well-rounded slate of panel discussions and workshops for both readers and writers. With such a large number of artists, it’s a great place to meet your favorite authors. In addition, there are craft displays, food vendors, book sales, musical events (including the famous Rock Bottom Remainders group), activities for children, and the always-popular Science City. The festival has raised over a million dollars for literacy events. Best of all, the festival is FREE to the public. ← Effing Feline Flies Again!